Thousands of South Vietnam people congregate outside the American Embassy in Saigon hoping to get through the gate guarded by U.S. Marines and climb aboard U.S. helicopters that would take them to safety. This was during the final days before North Vietnamese and Viet Cong troops marched into the capital city. Marine Cpl. Randy Smith of Venice, Fla. was one of those guarding the embassy gates. Cpl. Randy Smith knew the war in South Vietnam was over when he was ordered to take down the American flag at the U.S. Embassy in Saigon. Two hours later the major ordered Smith and Lance Cpl. Duane Thomas, another guard to lower the flag near the embassy’s entrance for the last time. “We walked over to the flag that was on a pole in a garden area inside the embassy and gently brought it down. We folded it properly into a triangle, saluted and handed it to the major,” Smith recalled. The 19-year old embassy guard, who now lives in Venice, Fla. and for a decade taught fourth and fifth grades at East Elementary School in Punta Gorda, Fla., had a premonition after a year of duty in South Vietnam that Saigon was about to fall to the enemy. The war was a decade-and-a-half-long effort by the United States and some of its allies to keep the southern half of Vietnam from being absorbed into the Communist block of nations. 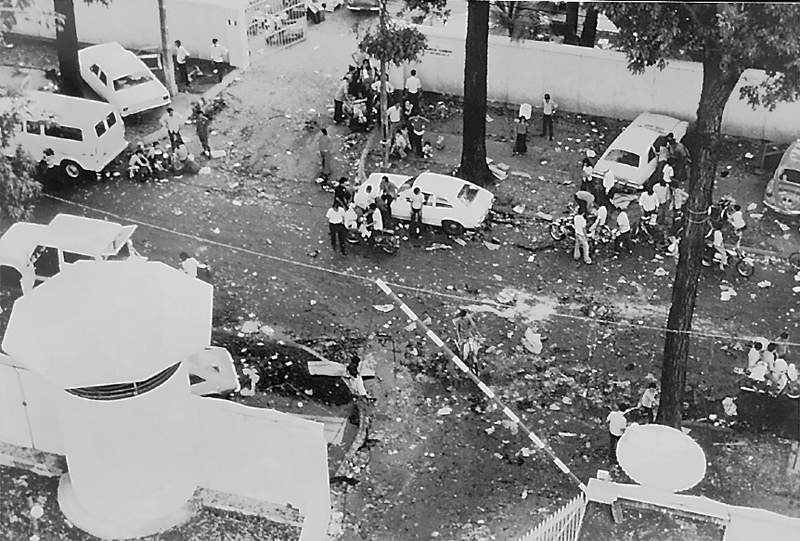 It was a failure for the United States he concluded on the roof of the embassy in Saigon 28 years ago. “Things started really falling apart at the beginning of 1975,” Smith said. “They evacuated our embassies at Da Nang, Naha Tran, Ben How and Naha Tranb as the South Vietnamese Army fell back in disarray. After the American soldiers pulled out, South Vietnamese officers and men turned tail and ran in the face of the enemy. “The last month we were there, you could go up on the embassy roof at night and see artillery shells exploding all around the city. The North Vietnamese and Viet Cong soldiers were tightening their circle around Saigon. “A few weeks before the fall, South Vietnamese civilians who worked for the Americans started showing up at the embassy. They were trying to get visas to get out of the country. They knew bad things were happening because we had closed all our other embassies and the enemy was closing in on Saigon.” he said. More and more civilians kept coming to the embassy. During the final days, thousands of distraught men, women and children surrounded the U.S. compound screaming they wanted out. They knew that once the North Vietnamese Army arrived they would be targeted for death, torture or at the very least a “reduction camp” that was little more than a World War II concentration camp. Possibly as many as 10,000 civilians lined the outside embassy walls the last day or two, desperately hoping to get a visa and a flight out, according to Smith. It got so serious that a detachment of a couple hundred Marines from the 7th Fleet, anchored offshore, were helicoptered in to protect the outside perimeter of the embassy. They were put on guard 24 hours a day, ringing the outside wall until the final hours. Tension was building inside and outside the compound. It had been prearranged by the ambassador and the 7th Fleet commander that playing Bing Crosby’s White Christmas on the radio was the code to start Operation Frequent Wind, the helicopter evacuation of the embassy. When Marines heard that song, they were to cut down the trees in the embassy parking lot so the helicopters would have more room to land. The civilians went crazy, Smith said. They started scaling the embassy walls, knowing this was their last chance to escape. The guards tried to hold them back. “At 3:30 a.m. on April 29, the first choppers came in,” Smith said. By then he had been detailed to man the gate the South Vietnamese civilians were allowed through on their way to the rescue helicopters. It was his duty to count heads when they came through the gate. He would send groups of 50 to the CH-53s, the big choppers with two rotors, landing in the parking lot inside the compound. Groups of 35 civilians were dispatched to the heliport on the embassy’s roof where CH-46s, the smaller helicopters, landed every five minutes. “Marine, Marine, I’ll give you anything to go,” some yelled. They were clawing to get free. Men had lost their wives; mothers couldn’t find their children. They were all in a panic. It was chaos. By this time, Maj. Kean had received a call from President Gerald Ford. The commander-in-chief instructed him to notify the ambassador it was time to go. Helicopters were landing two-by-two every five minutes to rescue those lucky enough to get through the embassy gate and past Smith. For 28 hours the rescue continued at a feverish pace. Smith stood his post without relief the entire time. Finally, the Marine perimeter guards were brought back inside the compound a few at a time. Once they were all inside, everyone fell back to the safety of the main embassy building. The massive, 20-foot-tall teak doors were shut. A huge beam was put in place behind the 6-inch thick doors to keep them from being forced open from the outside. A grenade screen was set in place behind the doors. Those inside headed for the heliport on the embassy’s roof. The Marines who had guarded the outside of the compound were flown out first in choppers to the 7th Fleet. That left only Kean and his 45 Marine guards still waiting on the roof. Shortly before 7 a.m., the choppers stopped arriving. The rescue had run like clockwork hour after hour until that time. The civilians who hadn’t made it onto one of the outgoing helicopters earlier took a fire truck left behind in the compound, and rammed it through the embassy’s front doors. They got inside and ran up the stairway leading to the heliport on top of the building. Just before they reached their destination where Smith and his fellow Marines were waiting for a ride out, they came face-to-face with Cpl. 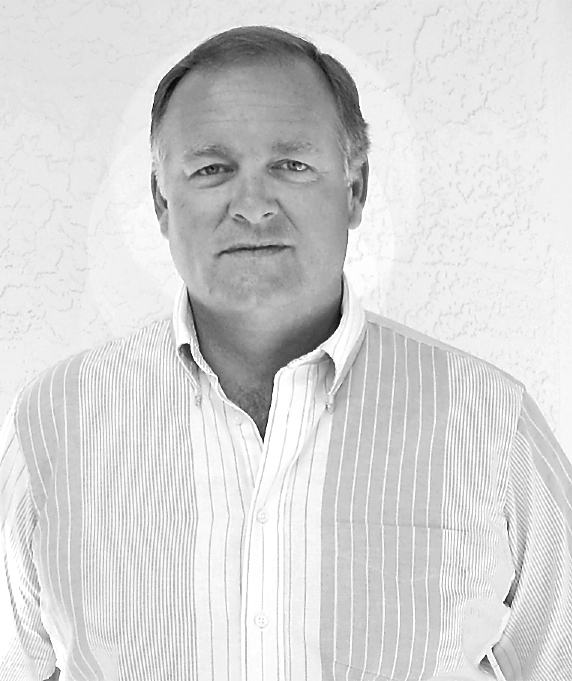 Stephen Bauer. he was guarding the door leading onto the roof. The corporal was waiting for the civilians in battle dress armed with an M-16 rifle. Bauer stopped the charging, panic-strickened crowd in its tracks and held it at bay. The first helicopter landed and one group rushed aboard. The chopper took off. A second one landed right behind it. Smith and a dozen or so more embassy guards climbed in quickly as it lifted off the pad and headed for the safety of the fleet. “The final bird touched down. Bauer, who had been holding the hysterical civilians at gunpoint, made a dash for it. He left a container of tear gas in the stairwell to slow the South Vietnamese down while making his getaway. The gas billowed out onto the landing pad and got in the chopper pilot’s eyes, almost causing him to crash on takeoff. Marine Sgt. Juan Valdez, the guard unit’s non-commissioned officer in charge, was the last American to scramble onto the last helicopter at the last second on the last day as it slowly climbed into the sky. He slipped and nearly fell, but was grabbed by several on board who pulled him to safety. By this time, Smith’s helicopter was well away from the embassy headed toward the fleet. Click here to read about Smith’s return trip to Vietnam. This story was first published in the Charlotte Sun newspaper, Port Charlotte, Fla. in April 2000 and is republished with permission. VENICE — “When I was 13 or 14 years old, in 1968 and ’69, I remember sitting around and watching the evening news on Friday nights. Walter Cronkite or David Brinkley would read off the number of Americans killed in Southeast Asia that week,” said Randy Smith . “‘There were 652 Americans killed this week, 540 killed last week, 400, 600,’ they would say on TV. On and on these counts went,” said the former American embassy guard in Saigon. “It got to the point where I wanted to go to Vietnam and fight for my country and help it win. But I was too young. “In 1973, when I graduated from high school, I joined the Marines. I didn’t know why I signed up at that time, but I finally figured it out,” he said recently. When he got out of the Marines, he weighed 212 pounds. “I’ve had different emotions throughout the years about the Vietnam War,” he said. “When I was in my teens and watching those newscasters giving body counts, I knew there were a lot of people protesting the war. I realized it was a very unpopular war. “One reason for its unpopularity was that our commanders wouldn’t let us win. We could have done it if they had let us, but they didn’t. “I can understand people not wanting to go to Vietnam because of that. I have sympathy for the Vietnam protesters and what they did to stop the war,” Smith explained. “But I wanted to go. It was my country, right or wrong. “The people I respect the most are the ones who actually saw combat. Those guys who had to go out in the rice paddies every day — it was an unbelievable situation for them. 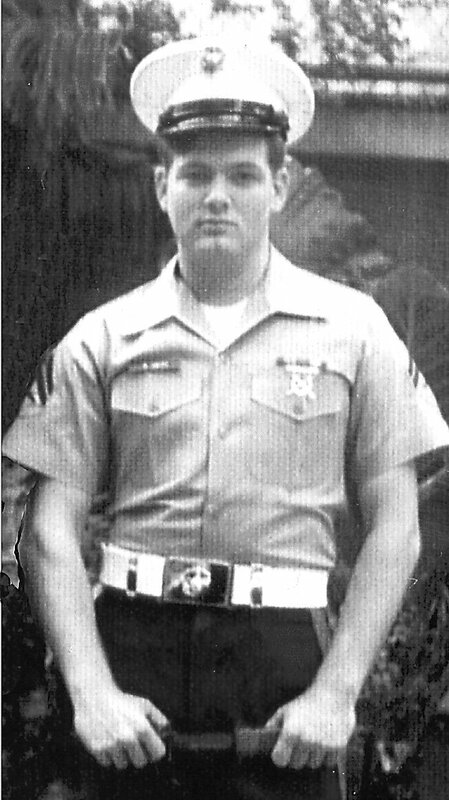 Randy Smith was discharged from the U.S. Marine Corps Sept. 27, 1977, after serving four years as an embassy guard in Saigon, South Vietnam, and Switzerland and completing his final tour of duty at Camp Lejeune, N.C. He was discharged as a sergeant with a number of decorations. It’s hard to believe that the end for American forces in Vietnam came with the playing of Bing Crosby’s ” White Christmas” at 4 p.m. on April 29, 1975, almost 30 years ago! In the middle of all the turmoil was Cpl. Randy Smith, a Marine guard at the embassy in Saigon, who now lives in Venice. He said he knew we had lost the war when he was ordered to bring down the American flag at the embassy that afternoon. It was the culmination of a decade of war in Vietnam that wasn’t a shining moment in U.S. history. Not only had we lost the war and been run out of the country, but there was a considerable amount of mixed emotions in this county about why we were over there in the first place. Just before the radio blared “White Christmas” the Marine guard was ordered to cut the trees in the embassy parking lot so that helicopters could fly in and land. Inside the American compound the choppers were protected from the melee in the streets. By that time there were 10,000 or more South Vietnamese outside the gates trying to get in so they could escape with the fleeing Americans. Smith and 45 more of his Marine buddies were charged with keeping the locals outside the embassy compound. It was a big job for a small force. At the 11th hour they received a detachment of Marines from the 7th Fleet who was flown in to reinforce them. By the following day it was all over in Vietnam for the Americans as far as the fighting was concerned. The Marines had closed up shop at the embassy in Saigon and flown away to the 7th Fleet carriers and safety. Left behind were thousands of South Vietnamese soldiers and civilians that had to cope with the victorious Communist invaders. It wasn’t a pretty scene. And here we are three decades later in Iraq and Afghanistan trying to cope with another guerrilla war far from home and not doing much better than we were in Vietnam. When will we ever learn? Thank you for letting me know. We strive for accuracy. USAF Vietnam vet of two tours here. Could you contact me when you get a moment. I am an ADMIN for a Viet Nam Vets Only FB page and I must have screened over a hundred guys who claim they were in Viet Nam as USMC Guards at the Embassy in Saigon. It sure would help me screen out posers and fakes if you could help me out. Thanks You. One solution would be to require a copy of their DD-214. If they want to be a part of your page, it’s the least they can do. We know Randy White served at the embassy. Maybe he would remember some of those men. Maybe there’s a roster of Marines who served there. Have you looked for such? I don’t find 100 Marines claiming they were at the Embassy in Saigon unusual ?? How long did we occupy the Embassy? My little sister was a State Dept vice consular in ho chi minh city a few years ago. She told me she was constantly surveilled. Said she felt safer there than in DC. Proof of foreign service is enough. When did Marines start lying about valor? Marines don’t lie about their valor. They don’t even mention it. The posers are just as likely to lie about being Marines. Semper fi. If you’re asking to post one of your own images on this website, sorry, we don’t do that at this time. Thank you for your interest in War Tales. Check your Facebook messages. My husband also served at the Saigon Embassy around this time and I really enjoyed this article. for the DOS. 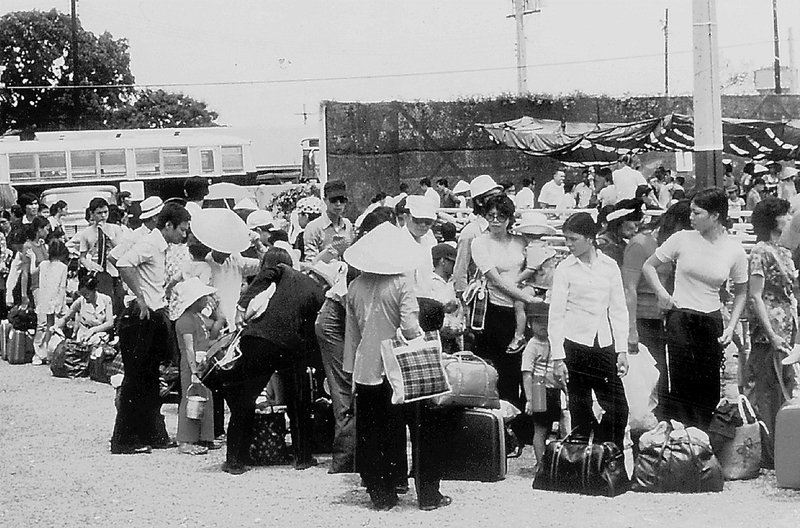 I also was the 2nd person to return to Vietnam before it reopened to anyone. I am also the person who got all the POW Photos from inside Hanoi’s Secret Archives, solving The MIA Mystery back in 1993. The Museum of the American G.I. has the Department of the Navy United States Marine Corps brass plaque from inside the Embassy that was removed by Marine Sgt Major Carl Loker at the fall of Saigon 1975. I understand the flag is kept in a bank vault and not on display for the American People to view. Would your organization be interested in placing it in a military museum located in College Station Texas. It would be displayed alongside the plaque and right above a Vietnam River Boat (PBR).